Review: I am an emotional train wreck right now. 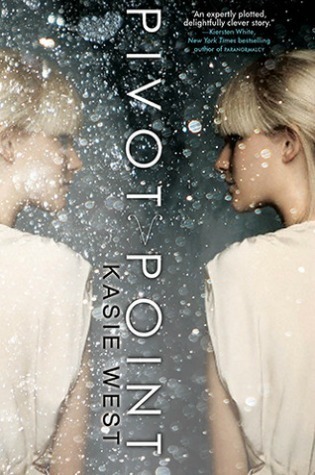 Seriously, Pivot Point is brilliant. I don't even know how to cope with it right now, let alone really review it, but I finished it moments ago and I want to get my thoughts down while they're still fresh. My very first impression of the book was a mix of "Wow, this is kind of a terrifying world" and "This book is obnoxiously cliche." However, neither of those original impressions really lingered for very long (well the first one did a bit). Addison is a girl with mental powers who lives in a secret city called the Compound. Beyond the fact that everyone who lives there has mental abilities, it's a fairly average place. Addie has the ability to Search, or view the consequences of each side of a choice placed before her. When her parents get a divorce, she Searches to decide whether or not to stay with her mother or go with her father into the normal world with the "Norms". This is where the book evolves from average-ness into awesome-ness. Each subsequent chapter alternates between the story line of the two choices- but the choices play out as if Addie had actually made that decision. There's the story line where she stays with her mother and gets involved with the star quarterback and then there's the story line where she goes into the normal world, makes new friends and meets a normal guy who was mysteriously injured in a football game against Addie's old paranormal school. The stories remain separate, but the same key plot points happen in both, and you get to see how Addie's choices play out in either story, from different viewpoints. I found it especially delightful as the reader because when a protagonist makes an important choice in a novel, I tend to spend the rest of the book wondering in the back of my mind about what would have happened if they had made a different choice. I got to see two completely different dimensions intertwined with a sinister and interesting plot and I loved it. I found myself comparing the different choices and really getting involved in the book. I do have one small critique though, which was that there was some minor confusion in the middle chapters of the book when the plot events in the stories coincide really closely. It was vaguely tricky to remember which chapter I was in and which life Addie was living. I blame this partially on the speed at which I read, which is terribly fast (I started and finished this book today in between class and work). Sometimes I read so fast, I don't have the time to properly record the events that I'm reading in their right order and it gets a little tangled. So if you're a fast reader, keep in mind that you might have to pause for a moment to straighten things out, but it's definitely not a reason for you to avoid this book. I could semi-predict what was going to happen before it happened, but I was just barely ahead of the book and it kept me on my toes. I wanted to know which choice Addie would pick when she was done searching, because I just couldn't decide ahead of time. And in the end, when she made her choice, I was amazed. Not because it was some huge break from what I expected or from the rest of the novel, but because it wasn't conventional and it was just...heartbreaking to me. The way the choices played out...it just...UGH. I really wish I could pick the plot events apart here, but I don't want to give anything anyway. I want you guys to read the book and be as surprised as I was, as engrossed as I was, and as impressed by this novel as I was. YES!! So glad you enjoyed it. We just read and really liked it too. (Blog post here: http://www.weheartya.com/2013/03/2-for-price-of-1-dual-narratives.html.) And sadly, yes, it's not longer, BUT there is going to be a sequel or a companion novel or something!!! Line we can't forget: "You don't choose this." I really liked this book too and also had a bit of trouble keeping track as a fast reader-glad someone else has that problem!